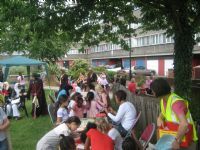 Latymer Community Church loves Ladbroke Grove and is rooted in the local community. Our vision is to follow Jesus, love people and make disciples in Ladbroke Grove. 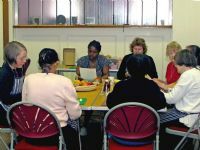 The church has a long history of working in the North Kensington area and uses its building (formerly known as the Latymer Christian Centre) to host community activities which enable us to build relationships in the area. Our Eden team (Eden Ladbroke Grove) works with local young people encouraging them to make positive life choices. In addition to this we provide a home for other local organisations to run groups and activities that benefit community members of all ages. Our community has been devastated by the Grenfell Tower tragedy, and recovery is slow and painful. We are committed to continuing to walk with our friends and neighbours through this complex and difficult time, and to continue to bring the hope that we find in Jesus. We are a registered charity (The Latymer Christian Fellowship Trust) and company limited by guarantee. Our Sunday gathering as a church is at 11am, all welcome.